Remember this little kaleidoscope design I showed you last week? Well, I expected to finish it the very day we spoke about it. I mean, it’s not as if it’s a high pressure stitching job. It’s not as if there’s any difficult techniques involved. After all, it’s just Fun Stitching. It’s an easy Afternoon Finish. But you know, sometimes, things don’t always go as planned. 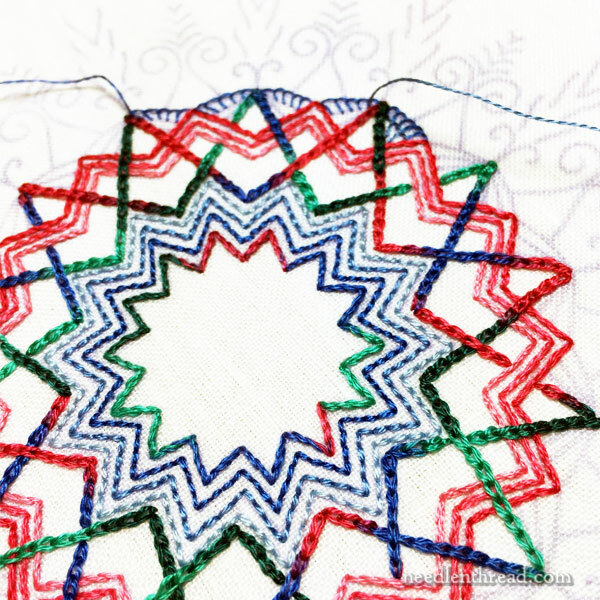 Have you ever noticed with your embroidery projects that, sometimes, it just takes one wrong stitch or one wrong decision to throw you off the project for a bit? This happens to me more frequently than I like – but it isn’t necessarily a bad thing. Now, take the photo above. All was going along just swimmingly until I started putting in the buttonhole stitching around the large peaks worked in chain stitch. You can see the little buttonholed area at the top of the photo. And wow. That threw me off. I didn’t like it at all. And it’s been over a week since I’ve picked the piece up to fix it. Writers have Writer’s Block, and stitchers have Stitcher’s Block. If you’ve been stitching for a while, chances are, you’ve experienced Stitcher’s Block. Stitcher’s Block is not necessarily a bad thing. When you come to a screeching halt in a project because something has gone amuck, you have an opportunity. You have an opportunity to step back, to distance yourself from the project for a little while. And this distance gives your mind time to stew, time to consider, time to generate new ideas, even if you don’t consciously spend the time away thinking long and hard about the project that you abandoned in frustration. It’s still there in your head, and it’s working itself out. The real problem is when you let Stitcher’s Block become a permanent wall. If you make up your mind never to scale the wall, then chances are, you’ll be stuck for good. But if you give yourself time and just step away for a bit, you will reach some level of clarity. 1. You might decide that the glitch that halted you isn’t so bad after all. You might actually find yourself satisfied with it and able to move on, right where you left off. 2. With fresh eyes on the piece, you might have a Genius Moment and know exactly what you want to do, to fix the original point of dissatisfaction. Oh. And there is a third option. But while I’m flailing about on my motivational spiel here, do I really want to mention it? You might revisit the project and find yourself increasingly dissatisfied with the entire thing. You might discover your instincts were right. You might realize the whole piece stinks and it’s time to do away with it permanently. And you know, that’s not necessarily a bad thing, either. If it’s hanging around your neck like a millstone and it’s keeping you from moving forward creatively, getting rid of it – or at least allowing yourself to pack it up and put it away semi-permanently – may be the only answer. It sounds like I’m gearing up for an excuse to turf this little project, doesn’t it? Not at all! I took it up yesterday and discovered a new path to follow. Thanks to the break from it, my Stitcher’s Block has dissipated, and now I’m happily moving along on it once again. Have you ever experienced Stitcher’s Block? What do you do to overcome it? What kind of decisions do you find yourself making that help you to move on? Do you have any advice for those who might be experiencing something similar right now, and who might need an extra nudge to get going again? We’d all love to hear your input! Feel free to join the conversation below! November 4, 2014 I Believe in UFOs! I will often get a slightly different block; the I Made A Mistake And Can’t Figure It Out block. And you are right — setting aside for a few days helps un-jam the block! Fresh eyes are a wonder! The only downside is that it is too easy to turn that WIP (work in progress) into an UFO (unfinished object)! I don’t really get stitcher’s block, but I do suffer from stitcher’s boredom, especially with a large project. When that happens, I set the “boring” project aside and work on a small “instant gratification” piece. It sometimes takes me a long time to finish my UFO, but eventually I do, and I get a lot of variety along the way. This is true confessions time! I have always been frustrated by using patterns that were created by others. I like the freedom I am given when I make a mistake and I don’t rip it out! If there is something about a project that needs a different color or needs to go in another direction, I love doing it without asking permission! Rebellion? Yes! It’s like using a new condiment on a hot dog instead of mustard and ketchup. Yes, me, too! I don’t do kits anymore (I always want to use different threads, or more, or less, or those threads with a different pattern entirely but there isn’t enough to play with…), and I don’t do counted stitch at all because I can’t easily change it if I want to. And I almost always want to. Oh my goodness, YES! Sometimes I just get bored, but often it is because of a glitch and I just don’t want to deal with it. I have several 17th C samplers that I finally finished after setting them aside, one waited 7 years to be completed! But it’s beautiful, I’m so glad I picked it up and got it done. And there are plenty more UFOs available to me, as well as NYSs(Not Yet Started). Your art and science of overcoming Stitcher’s Block is an inspirational message about managing problems life puts in your path, as well as resolving stitchery that somehow doesn’t seem just right. So thank you ever so much for both stitching tutelage and lessons on life. You’re the BEST! I so appreciate your candor about the stitcher’s block and the remedies. Historically I have used the first two, but some months ago I employed the third. I had some beautiful yarn in a lovely shade of purple that I had been knitting into a sweater for myself. I knit it and took it apart no less than 4 times over a 3-4 year period. Finally I thought I had it right, but I didn’t. My husband, usually oblivious to my stitching, said, “throw it away”. Wow! Permission to fail! We threw it away and I have stitched so much since! Somethings are just not meant to be. Can any of those UFO’s ever return to a WIP status? The guilt of spending money on very nice fabric etc and there it sits, even out of sight it still talks to me. Guilt. How to over come it and move on? I cross stitch so the supplies are not that expensive but with that being said, if I just know I am not going to finish something I give to Goodwill or other thrift shop. Guilt is guilt and I don’t know how to make that go away. but you are more likely feeling regret (after all, guilt implies you are to blame for something you did bad). I rationalize things a lot, so whatever you spent on the project is water under the bridge, its already spent and torturing yourself with the fact that you won’t finish is actually more expensive than whatever you may have spent on it. Money comes and goes and the money spent on this is already gone, whether you finish it or not. Hope that made some sense. I suggest the following treatment: Take all of your UFOs out of their resting place(s). ALL of them, onto one (big?) heap. Then, take each one into your hands separately and see if the project sparks joy in you. If it does: Give it a chance and make it a WIP again. If it doesn’t spark joy: Thank it for inspiring you once, say goodbye, and give it away. Let it go. Maybe it will find a happier life elsewhere, someone else might finish it and feel proud of it. But you – for sure – will get rid of your blocks and the guilt of not having treated those UFOs well. Obviously, I’m heavily leaning on Marie Kondo’s advice here, which during the last six months helped me to overcome several huge blockades in my life and millstones around my neck. I got rid of them, and it certainly feels good. I often have “stitcher’s block” – usually because life gets in the way of me-time. If I’m creatively stuck, I stare at it for a period of time, and somehow in my sleep, I figure it out. Some of my best work gets fixed in my sleep. Omg I related so much to your writing today. I get stuck, make a mistake and my mood can turn south really quickly. The best thing I can do is step away. This does not mean not thinking about it, but merely getting new perspective. What can happen is that the piece cannot be saved. The best that could happen is that I take the work in a new direction. Maybe add a bead or 2 to turn disaster into “beauty”. For me it’s important not to jump to conclusions that my work has failed. I am a stitching novice. The stitching journey and language of the stitches is what is really important to me. Have a great day all. Now wait a minute. Ask yourself is this a mistake? I think the stitch gives the sharp points a softer look. Mixing things up a bit makes a project more interesting. If you wouldn’t have pointed this out, no one would have noticed. Strive for excellence in your beautiful stitching. Perfection is God’s work. What a wonderful phrase: “Strive for excellence in your beautiful stitching. Perfection is God’s work.” I am committing this to memory, and writing it on a 3×5 card to place in my stitching basket! Thank you for your words! My block is almost always with a counted thread piece. I simply can’t count! But, I know that I’ll eventually love the finished project, so I often turn it upside down and start again. More often than not, it works. Mary, I’m so glad you wrote about stitcher’s block! I think it affects all of us at one time or another. It certainly has become a regular enough thing with me to have spent quite some time figuring out when it occurs, and what it usually means. When I create a crewel design, I generally have a fairly well fleshed-out plan of the stitches and colors when I begin to stitch. However, at some point along the way I hit a wall. Stitcher’s block seems to be my mind’s way of telling me a design is going south–that what I originally had planned isn’t working. Instead of forcing through it and continuing with the stitches or colors I’d initially selected, or putting it aside forever, now I stop, take a day or so off, then pull those stitches out! Yes, it used to be almost painful to take out those hard-won stitches, but I do it earlier now and don’t lose as much time, knowing that the block was an indication that I’d strayed from the overall aesthetic quality I’d intended. I’ve found that when I approach that section again with a fresh eye, my enthusiasm for it has returned and I can recapture the original excitement about the work. For those rare works for which I lose all enthusiasm entirely and tearing out stitches doesn’t seem to re-ignite my interest, I’ve found it’s usually a matter of proportion–the design is too big or too small to satisfy and needs to be re-sized. That usually works. I began three different sized versions of my latest design, Kashan, before I understood it was not one of my customary large designs, but a very small one. So, I consider stitcher’s block my friend, and I’m grateful for it. Thank you, Anna, for your post. I am relatively new to stitching and I’m still on the newbie side of the learning-curve of just about everything! But I totally understand what you said about taking out those hard-won stitches, and now I just “do it” when I know I must! I used continue on and “hope” that I could compensate and/or work things out. Now I don’t wait so long, and invest even more time in my piece, I just do what I know in my head I need to do and count it as a part of my needlework journey. I always seem to have more than one project going at a time. If I run into a stumbling block I just put it aside and work on something else. Seems by switching my brain onto a different project my subconscious has time to work out the other problem. And it sounds funny but sometimes I will go do my housework instead of stitching. Totally switches my brain and when I come back I am refreshed and can usually see the problem and how to fix it. Although I have to admit housework is at the bottom of my list and embroidery is at the top. I get stitcher’s block quite a bit but not from mistakes or things I don’t like about a project. I tend to tackle those head on, and by tackle I include chucking it in my Goodwill donation box. I get stitcher’s block out of no where, no real reason for it. I just sit down to stitching sometimes and think, gee, I could be doing something else with my life and then off I go for a few weeks, or even months. I always come back to stitching though, no matter how long the break. I have to step back too! Heard the expression “sleep on it” – 9 times out of 10, the obvious solution is there, for me, the next day or two. Great fun, actually, and a learning experience. Most of my WIP’s and UFO’s are the result of something more interesting coming along. I often get bogged down because a project is just plain boring and going onto something else for awhile keeps me going and then when I come back to previous project it is (sometimes) new and more interesting. Color is often a problem and I either go ahead with the designer’s choice and hope for the best or I change the color and hope for the best. Sadly, I have a lot of UFO’s that fall into the 3rd option–I simply have no interest in them any more and I wish had the strength and courage to discard them(for good) and forget about them. Instead, I hang onto them hoping that at some point I will go back and finish them. Yes I do, dear Mary! It happened last month. I was working on a Punto antico project that was taught at the Seminar of the Embroiderer’s Association of Canada last May. I had done a terrible mistake of cutting the wrong threads and had to rethread, but I also had to change a bit the design because the fabric wasn’t as strong as it was before. For a while I thought that I would have to redo everything from the start ( at least 80 hours work ). I was discouraged and I did procrastinate and put it away for a few days, not knowing what to do with it. I have to add that putting it aside permanently wasn’t really an option since I had a grant to go to that seminar and I have to summit a photo of my piece by the end of the year. Putting it aside helped me to think and to see options and to lessen the pressure. I finally started back with modifications and I think the result will be fine after all. Loved your blog today. Nice to know how to deal with stitcher’s block. Hope you are feeling better. You are in my prayers. I often have stitchers block when I am hard at it stitching away, but the next time I pick up the piece I really dislike the stitching which has taken me a whole afternoon to complete, but out it comes and I start again. Sometimes I rip out the piece 3 or more times, I know of one project where I ripped out the eye I was embroidering (difficult things eyes) 8 times because I couldn’t get it to match the opposite eye which I liked, thank goodness for good quality linen. Each time I ripped it out I got so frustrated with my self because it took ages to stitch, but I was glad I did and perservered. On another project I couldn’t get the thread colours right so out it came 3 or 4 times until I was happy with it. Other times when I leave a project and come to it I like what I’ve done so it stays. So I say stitchers block is a good thing because you have a different perspective on the project when you return to it. Thanks for sharing your thoughts and advice on stitchers block with us very useful tips. Here are some other stitcher’s blocks: I sit down to stitch and realize I need to go to the bathroom, I think about making a cup of coffee and can’t get it out of my head, my granddaughter needs me “right now”, my quilting is calling me, I’m too tired, I’m distracted by other things so my stitches are different, I lost me needle in my chair cushion again. Sometime blocks are only a few minutes long and sometimes a day or more. If I get a block on a stitching project, I switch to beading or sewing or spinning or kmitting and let the ‘problem’ percolate for a while at the back of my mind. Usually I resolve whatever it is. I have been experimenting with felted wool and embellishment stitches and I have often had to stop, look at what had been done,then put it aside for a day or two. More often than not, I end up removing part of what I had done, use a different stitch or change the type of thread used. Am so glad there is no timetable involved when working on my needlework. Hope you are having a good day. I have a bad time with buttonhole stitch. As soon as I saw your problem area I felt sympathetic. Frog it and put something else in there. Maybe satin stitch or whipped chain? Don’t give up. The rest of the project is looking great! Over the past year I’ve started asking my husband for his opinion when I get stuck about a color or stitch or layout. He has some great ideas! And he gets a kick out of seeing his thoughts materialize on the fabric. At first I called him my deign assistant, but lately I told him he was promoted to design associate! I have one stitcher´s block per month…. fortunately. They have saved me from doing really long stupid ugly embroidery projects. As I am not an embroiderer by profession, it is easy to step aside and look with new eyes, generally this is enough to find a way out and that includes throwing the whole thing away. I am glad that I am not alone. Case in point, I am a crazy quilter which is primarily where I do my stitching. Right now I am working on a wall hanging for my son. It is made out of a variety of batiks that I used in his “sane” bed quilt. For a while it was just NOT working. After putting it aside for quite a while I realized that the problem was lack of contrast in the stitching when seen against the highly patterned batiks. While this did entail buying a bunch of new threads, (Oh, what a shame!) the new seams look much better. I don’t think I’m going to have to rip, I think I can just add to the seams I don’t like to make them more in keeping with the rest of the wall hanging. This stitcher’s block issue is why I always have several pieces in process at any given time. Love the question, Mary. I have a sewing room full of interrupted art pieces. If I have stopped, there is always a reason; there is a design or color or technique problem. Walking away always helps at this point for me. However, sometimes that is a very long walk; hence the roomful I mentioned. Two good sides to this, though: I have recently changed my sewing area from one room to another enabling me to go through EVERY thing in my sewing room. The upshot of that was that I had the chance to gather all my unfinished pieces in one place, sort through them, organize all the threads, patterns, instructions, zippers, buttons, etc. in one place and I have put each in a heavy duty, zippered, large plastic bag, which I have now labeled, due to my new favorite toy: a label maker. There is one more upside to walking away from a troubling project. In time, with space, the way to fix the problem arises. For me that is often in the middle of the night. It also happens that I read an article or take a class and learn there how to fix what is stopping me. Now if I can live to be 200, one day, all those projects will be completed! No.3 has been my mantra for several years now. Whe. we were growing up it was drummed into us that we were to finish everything that we started (not just needlework but EVERYTHING). When I reached a “certain age” I realized that it is ridiculous to spend my valuable time on anything that takes me away from what I do like. Yes, I still do housework and such but I’m not compulsive about that either. My EGA chapter program this year was to finish those UFO’s that you really want and to give away or throw away those that only make you feel bad and/or guilty. Everyone was so happy when we had our “UFO Show ‘n Tell”! Next year we might give out awards for finished PHD’s (projects half done). Boy did you hit a nerve with this one today. I have been embroidering a pair of sleeves for what seems like an eternity. It wasn’t supposed to be that big of a deal; but it has really stalled on me! I think that I have an idea about where I am going next, and how to fix my dilemma. I will pick it back up this weekend, and should be done by next, if all goes well. And it really wasn’t that big of a deal, to start with. I guess the fact that it has taken so very long to finish, has thrown me off. Also being ill threw off my sewing for 3 mths. and that too has thrown off my mojo. I am glad to hear that I am not the only one that can be knocked off my game by a little glitch. lol! I get stitcher’s block when the pattern is made up of alphabetical symbols, rather than digbats. The whole pattern looks like one big amorphous blob. You have no idea how much joy your blog gives me. My sewing is no where near your expert level, however, it does give me lots of pleasure when I pick up a needle. Sewing is the most calming thing that I can think of. After we had bed bugs I could barely deal with doing anything for some time – years. The amount of work involved with preparing the house for the treatment and then putting back the house afterwards was too draining – among the biggest problems was that anything fabric had to be heated in the dryer 50 minutes on high and then bagged. I filled 60 bags between sewing, embroidery, and household fabrics. Then all that had to be put away (plus the rest of the house put back to rights). Then when I started doing things again (after sorting all the fabric items back – full house is still not back to where it should be) I could not decide which WIP to work on. I have about 2-3 hours once a week set aside to stitch (well, for sewing, which also includes hemming and darning). I kept going back and forth between projects which should have been finished long ago. I managed to get a couple of small, new projects finished. Then I decided to pick one project and work on it – did not matter which one. I have since finished 2 projects and am working on a couple of others depending on where I am on each and whether or not the next step takes a bit of thinking or planning. Tonight I might start a new, hopefully very short project – should take an hour or so or it is too long for what it is intended. I get stitchers block occasionally. I’ve been working on needle painting a trio of rosebuds and I keep getting mentally blocked on it. I think the main issue is I don’t like the way the one rosebud turned out. I’m going to get the rest of the piece finished and see how it all works together before I decide if I’ll take out that rosebud and redo it. I often have “stitchers block”, that is why I have several projects going. I step away and when I come back I usually have an idea of what I am going to do. sometimes I step away for a few hours, sometimes a few days, sometimes even longer. And yes I have gotten rid of some “millstones around my neck” that, for me, were just not worth salvaging! Glad to hear others have that too. Absolutely I get Stitcher’s Block, and also Sewer’s Block! I will get to a point where I can’t figure out what to do next, so I let it go for a day or two (or a year or two). When I get back to it, I’ll have it figured out. Well, sometimes. Often it has to sit for another while. I don’t know how it works, but I think we might figure out solutions to problems in our subconscious minds. Thank you Mary, this is where I am now. Didn’t recognize it for what it is. Have not picked up a needle for about a month. Cant feel the urge at moment. Pleased to hear this is normal. I also suffer from starter’s block – a dread of cutting into the linen in the first place, of taking that first stitch, or worse, of cutting that first thread of the various drawn-thread techniques that I would love to learn. So I have far more unstarted projects than unfinished or WIP. When I get blocked trying to do anything, not just embroidery, I have to go do something completely unrelated. If I am unhappy with an embroidery or sewing project, I might stay up all night painting my bedroom or go on a photo safari through the pasture or woods. When I come back to the original project I am looking at it with fresh eyes and attitude. I always have several projects going at any given time and since I am a quilter as well as an embroiderer, I can always move to something different if I get bored or blocked. As for making a mistake, I’ve always said if you do it once, it’s a mistake; if you do it several times, it’s a pattern. In embroidery, the only time I pull something out is if I really hate hate hate the color or my stitching is so lousy that I can’t stand to look at it and I can’t work over it. I rotate my projects. As I said, I am always working on several things. I spend a few hours on one, then switch to another. When one is finished, I can add a new one to the mix. Another advantage to this is that I always have something I can grab for stitching on the move or while waiting at the dr s office or elsewhere. Stitcher’s Block: Yep happens at some point on nearly all of my projects. I just set it aside. Sometimes for a short time; others get shoved to the back of the closet only to be found years later. After I’ve stepped back for awhile, it’s either thumb’s up or down. “Up” means I’m inspired again and reaction is, “what was the problem?” or “I know what to do!” If thumb’s down, then, “can I salvage any supplies?” Life is too short to agonize over bad projects. Too many good ones out there and both learning experiences increase your skills. Oh, heck yeah I have stitcher’s block! Just like you described, Mary. A few months ago I finally started in on a kit my husband had purchased for me. It was a design I really liked from a very well known artist who sells her kits. I was looking forward to it! I started… and stopped. Started… and stopped. And I finally realized: I. Just. Don’t. Like. It. I can’t explain it or put my finger on it — I just didn’t like it. Nothing wrong with the artist, nothing wrong with the kit, nothing wrong (well, nothing VERY wrong) with my stitching. I just did not like the whole project. So off it went and now I’m working on my own design and I’m having the best time. You hit it, spot on, as usual Mary. Stitcher’s Block? What do I do? Well, for about a year (about when Mary started doing her Late Harvest, I strted doing another one of the patterns in Hazel Blomkamp’s book – Pertinacity. And it’s taking a while..
For a bit of light relief from time to time I pick up one of the old unfinished things I inherited from my mother, or fiends, or a small thing for Christmas presents, & do that. When I complete something, I feel refreshed to get back to Pertinacity. Normally when I’ve had stitcher’s block, I put the project aside for a day or three. The danger is, I may never go back to the project and it then goes into the back of the closet. One trick I learned from you, change the viewing distance. I don’t recall the exact project, maybe the embroidery for the priest, you were not happy, until you walked into the workroom and looked at it from a distance. I might add turn the project upside down. In short, look at it from a whole new viewpoint. And yes, stitchers boredom! It’s why I have a huge crewel-type picture from the 70s partially done, a partially done fairly large cross stitch started about 7-8 years ago, and a quilt in the 2nd year of hand quilting (not even half done yet). It seems I either need a deadline, like the Hardanger piece (never did that before) for my parents 50th anniversary, or small pieces where I can see the end of the project. I also seem to be suffering from stitcher’s startitis. I have the patterns, often the supplies, but actual stitching just isn’t happening. Do you know what it is about those buttonhole stitches is not making you happy, Mary? IMHO, they’d be fine once finished all the way around. And perhaps have the company of other similar weight stitches in the piece. Maybe that’s why I haven’t picked up my embroidery in a while. Of course, I’ve gotten “blocked” before – many times! The problem I’m having with my project right now is I don’t know what stitches to use on a few of the design elements. They are elements that need to be filled and I want them to be completely filled (not something like lattice work or seed stitch), but I don’t want them to have a lot of texture, as something like stem stitch filling would. Do you have any suggestions as to what stitch I might be able to use? I am totally a procrastinator when it comes to learning new skills, art forms, techniques, etc. Lol! I guess it IS about time I just sat down and started learning long and short stitch… it’s summer and I can’t really use the “I don’t have time” excuse… and I think my project might really benefit from some long and short stitch filling. Yes, perhaps I’ll have to see what I can do. Thanks! Thanks Mary for the inspiring looking embroidery, where do the kaleidoscope patterns come from? Please don’t say they’re doodled! I can’t draw at all!